Will Just Eat continue falling, or will it rise again back to recent 575p yesterday’s highs? Just Eat shares have fallen over 5% today to trade 543p (at time of writing). Shares -37.6% from 2018 highs; +8.8% from 2018 lows; -30.6% year-to-date. 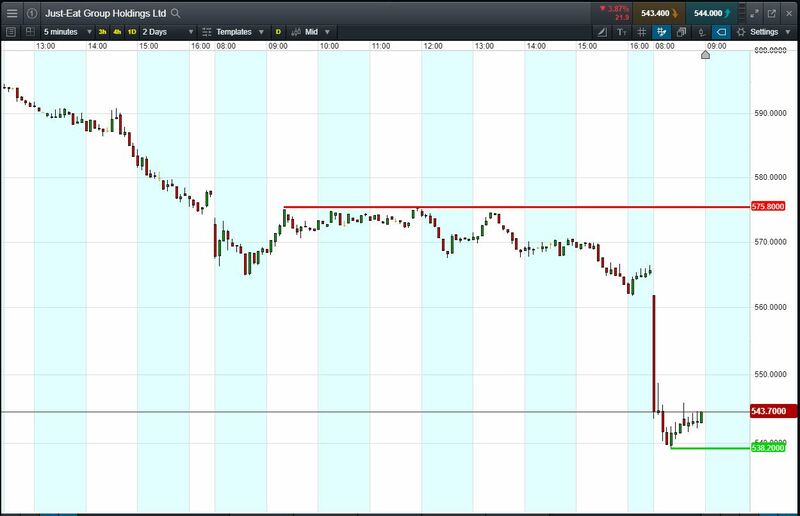 Shares of delivery company falling after it was confirmed it will be relegated from FTSE 100. Shares already 1% off their worst levels today. Can the shares regain recent highs? Let’s say you feel that the stock is a bargain and you think it could bounce back to recent highs of 575p. You decide to buy exposure to £10,000 worth of Just Eat using a CFD, at the current price of 543p. To do this, you need £2,000. Let’s assume Just Eat recovers back to 575p (+5.8%). Your profit would be £580, from your initial investment of £2,000. Conversely, let’s assume you open the above position, and place a stop-loss at 2% from the current price. Just Eat falls 2% and hits your stop-loss. Your loss would be £200.